Then came the song, Decem Urnae. It’s a modified version of the Decem Urnae song on the Minimus website, which is itself a translation of the Ten Green Bottles song. I tweaked the lyrics to make the lines more consistent and easy to remember, and the third line “si forte urna” I felt would make more sense as “si forte una urna”. iam novem urnae pendent ex muro. iam nulla urna pendet ex muro. Then there’s still… nulla urna pendet ex muro. I’m very proud of these primary Latin students from Spensley Street Primary. Most of them are in grades five and six, but some are younger and there is one grade three. 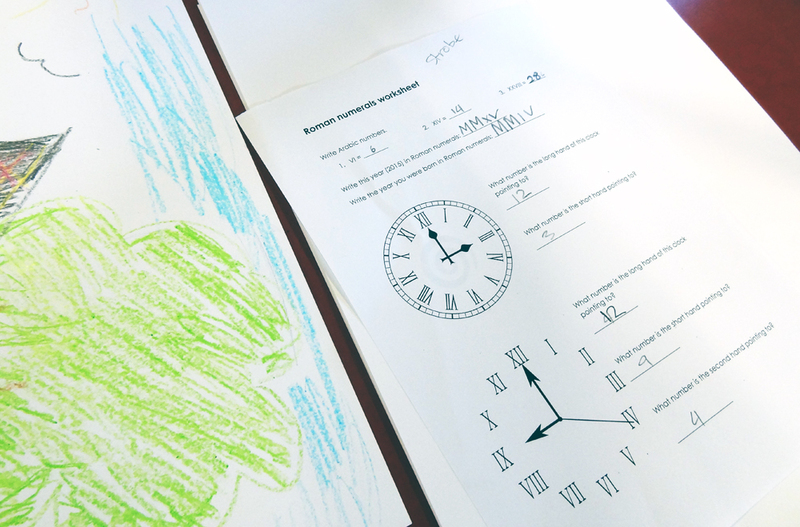 Our pilot program consists of five weekly after-school sessions, each an hour long. This has been the third session, and so far the kids have learned how to identify the subject, object, and verb in English and Latin; the case endings for nominative and accusative singular; how to read and write simple Latin sentences such as mater filiam laudat; and even (in the extra time left after the first lesson!) the difference between transitive and intransitive verbs. They’ve also been identifying Latin derivatives in English all throughout, and have been hearing retellings of myths while discussing the culture and history of the Romans. Many of them already have a surprisingly deep and specific knowledge of Greco-Roman myths, and will enthusiastically tell you about the specialties and attributes of each of the gods. I’ve never worked with kids this young, but what strikes me about them is how similarly they respond to the basic fundamentals of teaching. My goal in tutoring is always to make a grammar explanation as tight and short and useful as possible, then immediately pull up an example and ask leading questions about it. The essentials – brevity, clarity, illustration, student participation – are as important and as effective for the young primary student as they are for the older student. And when this is done right, the younger student can be just as switched-on and capable of “getting it” as the older student. But there are two differences in working with young children. First, it is undeniable that they have a shorter attention span than older students. 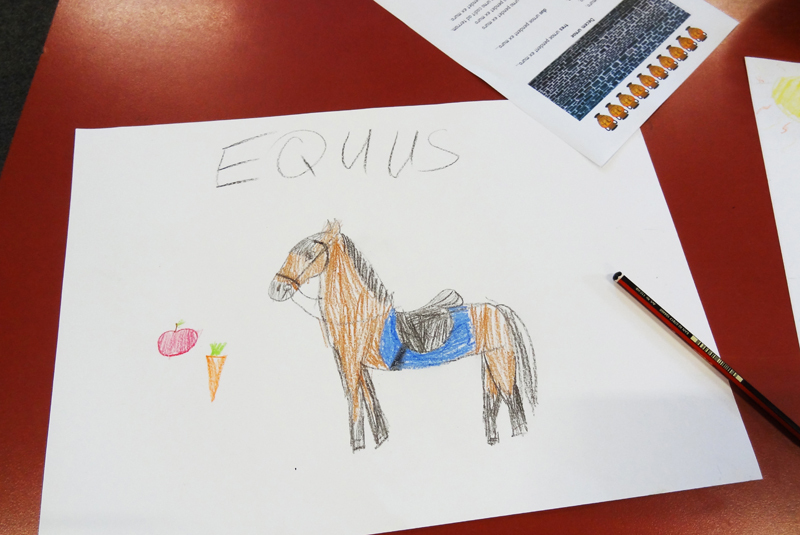 This means that the best lessons we’ve had so far have involved a mix of different activities – story time, a grammar chalk-and-talk, worksheets, drawing pictures for Latin caption words, singing, a group game, roman numerals, and so on. The kids are less cynical about grammar than their older counterparts, and are capable of learning real Latin syntax, but we also observed that on a warm Thursday afternoon they get restless if they sit through too large a chunk of grammar instruction and grammar work. Balancing heavy and light work and changing activities at least every 15 minutes is the key to keeping them engaged in Latin. The second observation I found is that the young ones know less about the world. Give them a word like donum and ask them what English derivatives come from it, and they will say “donut” nine times out of ten, and don’t really think about “donation” or “donor”. In the first lesson, I was asking them what modern languages were derived from Latin, and they got quite a few of the Romance languages right. Trying to prompt them into saying Portuguese, I asked them what language people speak in Brazil, but it seems their Geography class hadn’t taught them that yet. In any case, they learned that Brazilians speak not Spanish but Portuguese, that donut was originally spelled doughnut, and many other things that randomly came up. This is no fault on their part – they literally have less experience and less knowledge of the world. But Latin and Latin-derived terminology is so integrated with world history and human endeavours, both ancient and modern, that when learning Latin these students can’t help but stumble across interesting facts about the world that they hadn’t known before. A Roman numerals worksheet. Some students found it way too easy, others could barely move past the first questions. I kept the bright kids occupied by asking them to write my birthdate, 1992, in Roman numerals. I’m actually rather sad that next week will be the second-last session of our five week pilot program. Latin teaching at a primary level is a daring concept these days, and it is a privilege to be involved in such a project. In particular, the teaching of Latin syntax is very exciting. In the early 20th century, primary Latin students were mostly taught to memorise tables and tables of amo amas amat, years before they would ever see them in actual sentences or connect them with anything meaningful. Going into this program, I had not really heard much report on how well young students can cope with syntax. Courses based on the Minimus series tend to be very light on syntactic instruction, particularly of the case system. Our students have only learned nominative and accusative singular endings of three declensions so far, but at least we have a proof of concept that primary students can actually understand that Latin word order is flexible and Latin word endings tell you what the word is doing. The kids don’t move as fast on learning syntax as teenagers and adults, but given the right instruction and examples and practice, they really will get the concept. I’m particularly impressed with these students since many of them did not know what a subject, object and verb was in English grammar before this course, but they were very confident with identifying the subject-verb-object pattern in English grammar by the next week. Even at this stage, halfway through this short course, the students have picked up many things that will be valuable to their learning in other subjects. They have also been feeding their love of Ancient Rome and Greece, and will probably continue to explore more about these fascinating societies outside of our class. I hope that these students will continue to be enthusiastic about Latin and the Romans, and if the parents support this program enough to pay for the tuition we might continue to offer Latin as an after-school activity. Perhaps some day we could even have Latin introduced as one of the subjects in this primary school. Hi! Thank you for the nice website and interesting posts. There’s a mistake in your video, though: the lyrics should be “duae urnae” rather than “duo urnae”.